Tag-a-log With Carlee: 10.5 WEEKS NA LANG!! I've actually been studying about Lehi's dream lately and how important it is to "hold to the rod." The world is changing.. and the things we once did aren't always good enough... as Pres. Uchtdorf said "As we increase in faith, we must increase in faithfulness." I'm so grateful for this mission. I've learned so much. I took so many things granted before. We all have weaknesses and things we need to work on and be better at but as long as we try our BEST, Heavenly Father and Jesus Christ will help us with the rest. This week was good. We have a new housemate! We also taught zone meetings this week. Our topic was about dress and appearance cause the mission realized we've just gotten a little bit lazy or casual in some of the rules. So it was a good refresher for me as well as I was studying and preparing to teach the other missionaries. But it all went really good! I don't really get nervous to teach in English anymore... which is a plus. 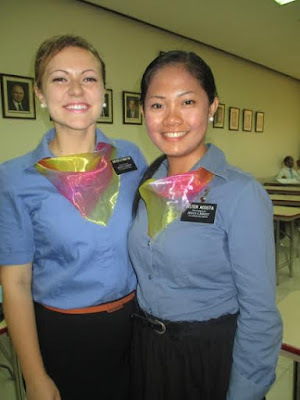 There's lots of new missionaries in our zones cause almost every companionship had a transfer! There's lots of new missionaries... as I'm getting older and older in the mission.. all my homies are goin home. It's kinda sad... but it's just life! And then last saturday was national service day or somethin like that so we helped clean an elemantary school. Tons went and it was really cool to help out. We are now teaching this blind lady. I love her so much! Every lesson we teach to her is so powerful and she is always willing to change and align her life to the Savior's. She never gets down or depressed about her being blind. It's been like 4 or 5 years I think. Well, we committed her to be baptized and she said she'll think about it which is definitely better than no! But we visited her last night and agreed to let us take her to church on sunday. So we'll go to her house and walk with her to the church. I'm so excited!! She's definitely one of the people I've felt like I've met before I came here. Not to mention.. her husband drives a pepsi truck so every time we go there they give us pepsi!! hahaha. This week was amazing!! Busy! But amazing. We had 2 exchanges, which were really good. We have our last one this friday and then one of the pairs of sisters want us to work in their area with them so we'll do that too. And we have another MLC on wednesday. Feel like we just had one... I don't even know where the time is going. And then we had the interview for one of our investigators last Friday. A member of the mission presidency came and interviewed him and blessed him and after he said. "Sisters, you cannot delay his baptism." So we had him baptized the next day! It was super hectic trying to get everything together but it was truly a miracle. We literally met him on April 6. He was soooo prepared, Mom. I just can't even explain into words... He is truly an example of coming forth with a broken heart and contrite spirit. I'm so grateful for this wonderful opportunity I have to serve. I know I'm never going to get a chance like this again. I will do my best until the very last day. :) And when I get home I will do the very best I can to continue to serve the Lord in the ways He will ask of me as returned missionary. Something I love that Sister Rahlf said at MLC. "We are not called to a place, we are called in the Lord's place." Because Jesus Christ is literally not on the earth today, we have missionaries to go in Jesus's place for a time. I love putting on my nametag every morning and seeing my name and His name. What a privilege and honor it is to bear it everyday. I know He lives. And He loves us and He loves the people of the Philippines. No matter how lost or how far we have strayed, we can always come unto Him and He will heal us. I love Him and our Heavenly Father. I love being a missionary. I received my "torch letter" this past week!!! It's for the missionaries that are close (ish) to going home. So that was weird!! There's some stuff we have to fill out and then they are going to set up our flight plans. In with the stuff I had to fill out is the talk by Pres. Uchtdorf about keeping our torches lit and finishing the race. So really good motivation. I want to keep my torch lit til the end and always do my best! So last week we received this referral from some of the elders in another area but it's suuuuper far. But we got her number and contacted her and made an appointment. So we were able to go there and she is amazing!! So her boyfriend is a member (which I met one time in Cauayan when we had a one day mission haha) in Echague and she's been going to church with him for a couple months now. 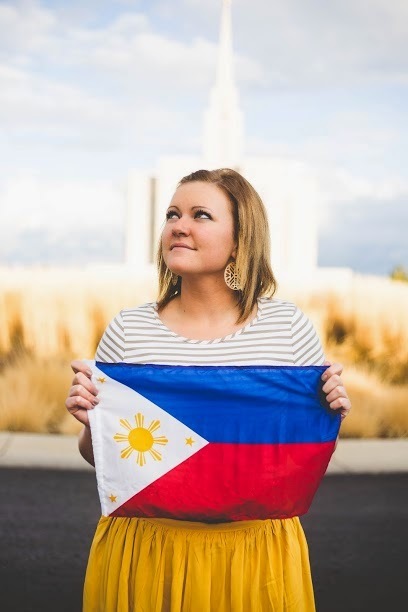 Her dad passed away in 2013 as well and when she heard about baptisms for the dead and temple work it really touched her. And now of course she wants her whole family to hear the gospel and be baptized! So her and 2 of her siblings came to church yesterday! And they loved it. And we taught them with their mom and they committed to be baptized on May 7 :) oh my gosh! I love them so much! The Lord has so many people prepared here!! The mom is kind of a stickler cause she's a devoted Catholic but I know she will be baptized! I just am so grateful for our family and that we have been sealed and now I get to share these simple truths to people who have no idea. But it's been a good week. Time is going by too fast. But I'm loving every minute of it. Thank you for everything you do mom. I can never ever thank you enough!! Hope you have a really good week!! I know this is the true gospel of Jesus Christ. I know He lives and loves us. And guides this church. How blessed we are to hear from His living prophet and apostles so soon!! YAY!! President and Sister Rahlf taught our zone meeting last week. And it was all about the Savior. Because here in the Phil it's Holy Week. And so people remember the death of Jesus Christ. So we just learned more of the things that we could share to other people and the good news that HE IS RISEN. Oh my gosh I love being a missionary and sharing about the Savior and His gospel. There's a cool video... Pres. Rahlf showed us. About Easter... #hallelujah. Whoever makes those videos sure does their job well. Gave me goosebumps!! We had stake conference yesterday. And we sang with our ward in the choir. They made us wear these colorful scarves with a button up shirt... I felt like a flight attendant. Hahaha but the song went beautifully! I know I'm never going to get an opportunity like this to share the gospel. Although they are really receptive here in the Phil you still get those people who don't wanna listen or see you. We were walking down one of the streets and saw one of our investigators literally run and hide from us. LIKE WHAT. I don't understand haha. But that's life. It's hard but I'm so thankful the Lord does have people prepared to listen and to receive the gospel.